Characteristic of this type is a long fuller, like a X, only narrower – but no so narrow as an XI. This is a very fine distinction and may seem unnecessary. In fact, in my original typology of 1960, I had not isolated it; I put all Xa’s into Type XI. It was only when The Sword in the Age of Chivalry was reprinted in 1980 that I decided that there was a clear distinction, and so in a new preface to the book I added my new Type Xa. It may seems a silly distinction, depending only upon the breadth of the fuller, but I think it is better that such a distinction be made. There is no real difference in dating X’s and Xa’s for both types were in use together from c. 1000 on. This is proven beyond any reasonable doubt by a series of swords found in the early 1950s by Dr Jorma Leppaaho, of Helsinki University, in a large group of late Viking graves in southern Finland. 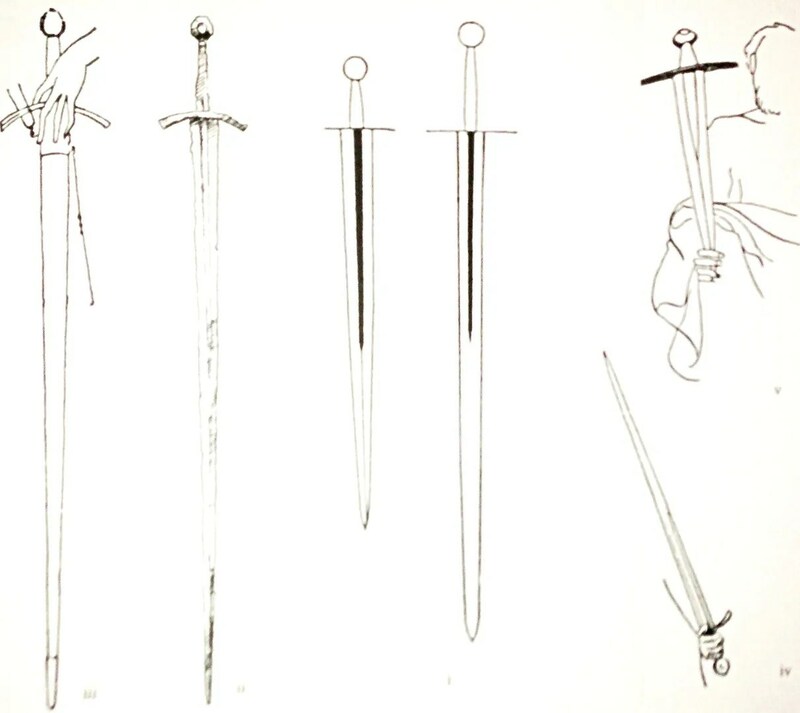 These are all clearly dateable to the second half of the 11th century, give or take a decade each way; and the information as to reliable dating, not by the form of blades and hilts but by the style and ‘handwriting’ of inlaid inscriptions, which subsequent x-ray photography of the blades provided, is absolutely crucial to the segregation of types of sword and sword-inscriptions, and their dating. Among these finds, the incidence of X types and Xa’s was about equal. Condition: Excavated, very good. The surface is lightly corroded in a curious mottled way, looking like some kinds of pattern-welding; but since this mottling goes over to the edges, it is most likely to be a rather unusual corrosion pattern produced by whatever organic stuff surrounded it. The remains of the iron-inlaid inscription (the inlaid strips have gone) is still decipherable. The spherical pommel is very small, which gives the sword an awkward, unbalanced look. Condition: Excellent. 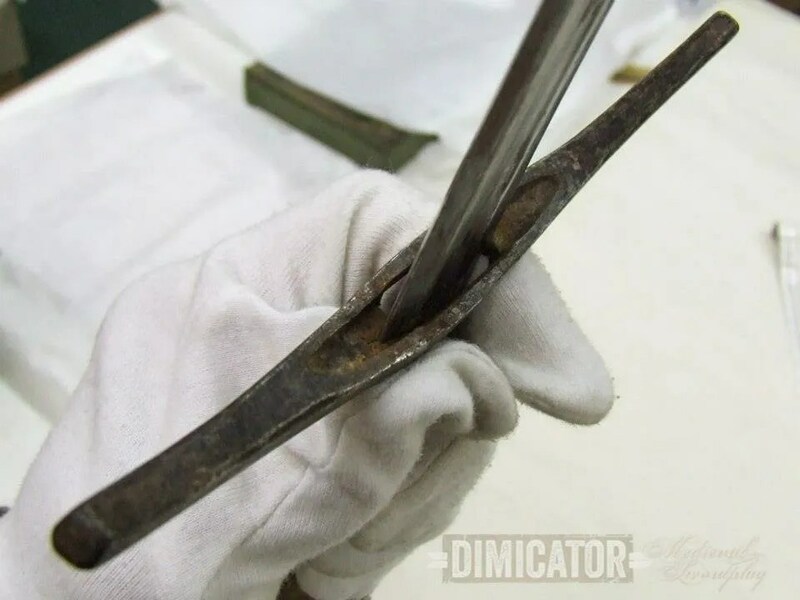 The long blade is hardly corroded at all, its surface being covered only with patches of shallow staining. There are a few marks of usage on the edges, but not significant. The hilt is of latten, once gilded (a tiny trace only seems to survive on one side of the elegantly modeled rivet-block. 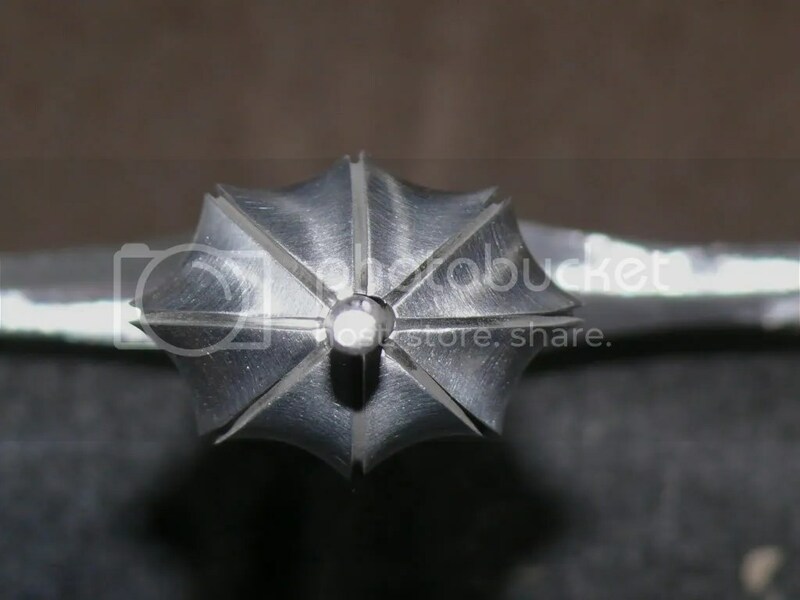 The central boss of the pommel is longitudinally ridged. The original grip of ?lime-wood survives, with a a narrow Turk’s head of brass wire (contemporary with the hilt) below the pommel. IN the narrow fuller in the blade, inlaid in iron, are the names +IESUS+ on one side and MARIA on the other. Following the second letter A in this name is an inlaid symbol (also in iron) which though extremely hard to see may perhaps be a rather naturalistic representation of the lily-flower always associated with Our Lady. At some time, an over-enthusiastic owner of the sword tried to enhance, or to make more visible, the letters of these inscriptions and began to engrave round their outlines. He ruined the I, E and S of the IESUS inlays, but fortunately gave up, and left the remainder alone. Had he done all ten letters, it would not be possible to see that they were in face inlaid in iron. 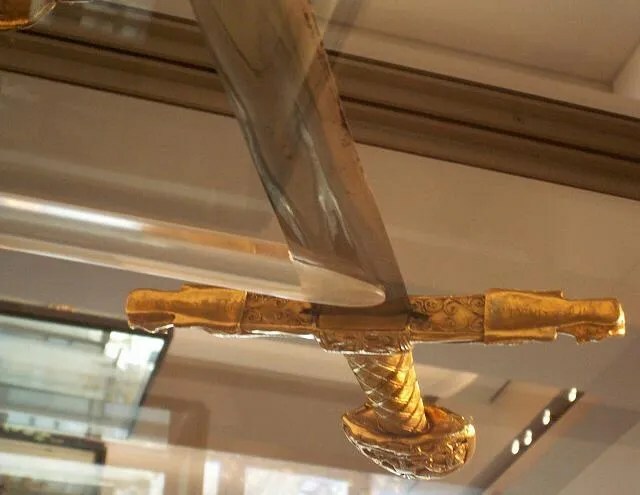 This sword was examined in the Royal Armouries on 27 April, 1989, when the metal of the hilt was definitely proved to be 15th century latten. 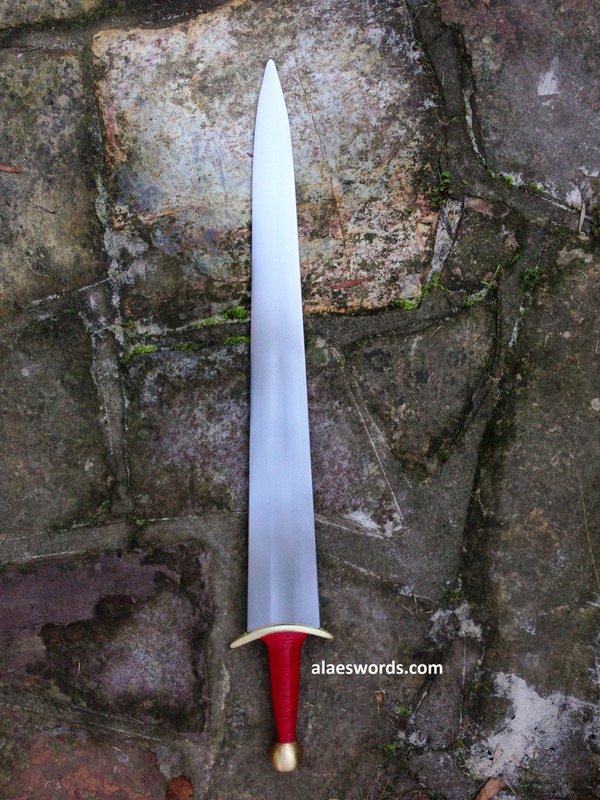 This fine sword provides an absolutely classic example of an old blade still in use, or re-used, three centuries after is making and mounted in a handsome, new, fashionable hilt. The sword is also important by reason of the (so far as I know at present) uniquely used holy names, inlaid in iron. There are INNOMINEDOMINI inscriptions, in iron, in plenty; there is on Viking blade inlaid on each side with the word AMEN, but this is in silver. Most swords of the Viking Age come into this category, and X (ten) has been chose to define the type, rather than 1 (one) because in the definitive anaylitical study of the swords of the Viking Period present by Dr Jan Petersen in 1919. [sic] He classified the latest of the Viking hilt-styles (hose with brazil-nut shaped pommels) as Type X (letter X). 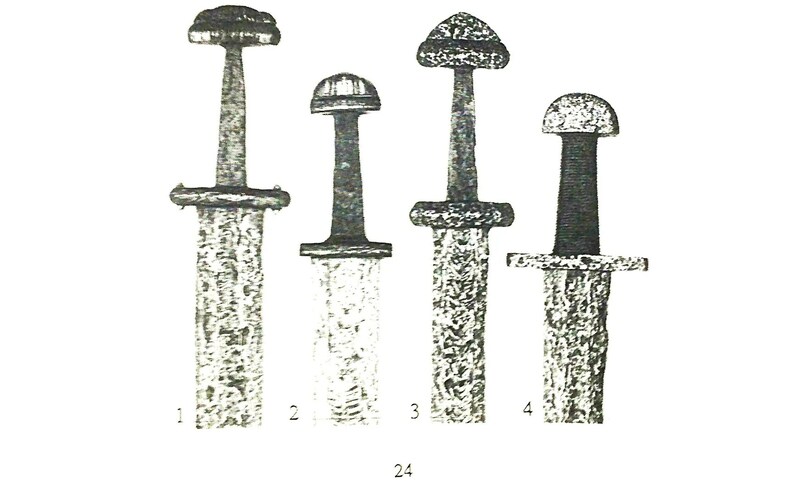 Since most of these Viking swords with brazil-nut pommels, as well as those which are rather vaguely called ‘Pilzformige (mushroom-shaped)’ by German archaeologists, all fall neatly into the first category of the typology of swords which I presented in 1960. I began my typology where Petersen left off, with X – number Ten. At the same time I, perhaps unwisely, renamed the ‘Pilzformige’ or mushroom pommel (which it wasn’t, being D shaped in elevation and flat in plan, not like any mushroom or toadstool known to botany) as ‘of tea cosy form’. This, to non-tea-orientated continental students must have made little sense. However, in an English context it is perfect. The laid-down ‘lazy D’ is just like a tea cosy. Those which are flat in plan are like on empty, those of a stouter and more rotund shape are like a tea-cosy with a teapot inside it. In the quarter-century which has lapsed since I named, or mis-named, this pommel form it is pleasant (tom em) to find that in fact the name has been very generally adopted. So, Type X is the ‘typical’. of there is such a thing, Viking sword with its great variety of hilt-forms and styles; and it goes on into the 12th century. Indeed, one may say it goes on into the 18th century as far as blade-shape goes, but there is no doubt it is seldom found as a blade-shape in any blade made new later than c.1200. Of course, many very old blades continued in use, re-hilted according to changes of fashion, as long as the sword was used. Condition: Excavated, but very good. Some very large pits. Condition: Excavated, but excellent. More corrosion near point. Condition: Excavated. Considerable corrosion, especially near to point. Condition: Good, excavated. Considerable pitting. These four Viking Swords were sold at Sotheby’s in London on November 1st 1983. Lots 100, 101, 102 and 103. 1. 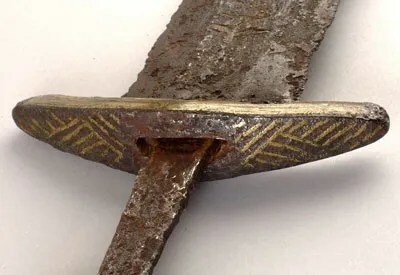 A fine pattern welded blade with a hilt of very early Viking form, if not late Migration Period, decorated with closely-set vertical silver wires inlaid in the iron. 2. 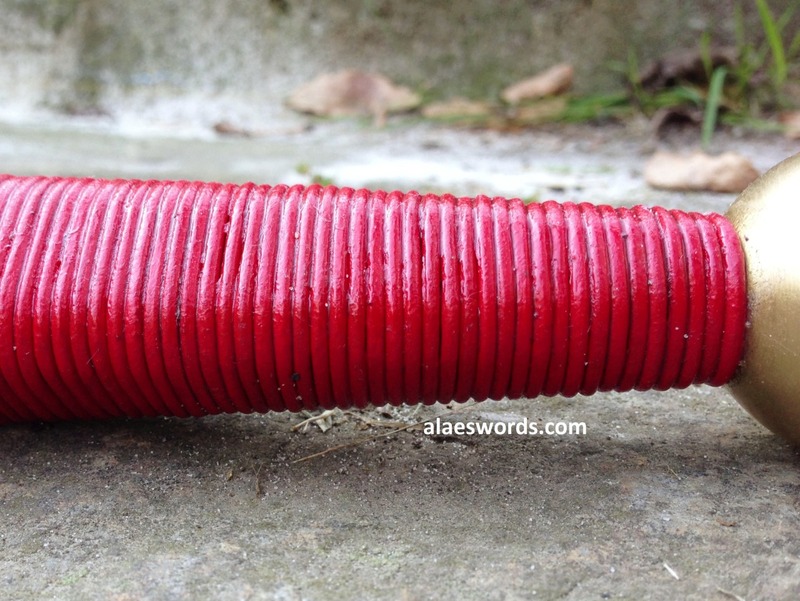 This is a most interesting and unusual sword. The fine pattern-welded blade patterns are, alternating, the ‘BLODIDA’ (Blood-Eddy) and ‘ANN’ (like rows of mown hay) of the Norse poetry, very clearly defined. One side (shown in the photograph) has a conventional broad shallow fuller, but the other has no fuller, but close alongside the edge (right side of this photograph) runs a very narrow groove, from the hilt almost to the point. 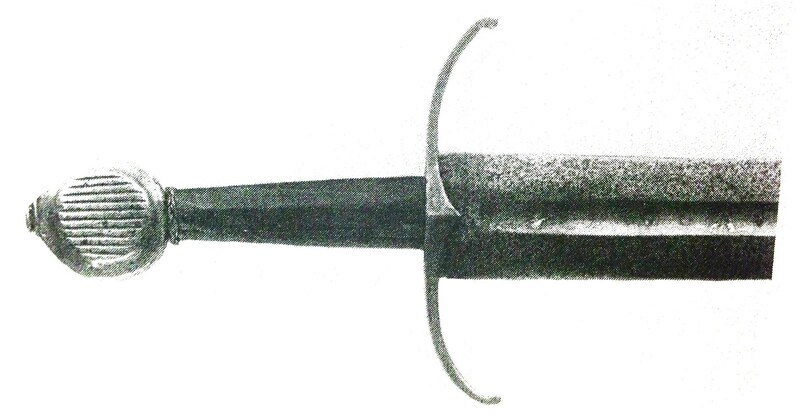 The tang of the blade, as you can see, is offset towards this edge of the sword. 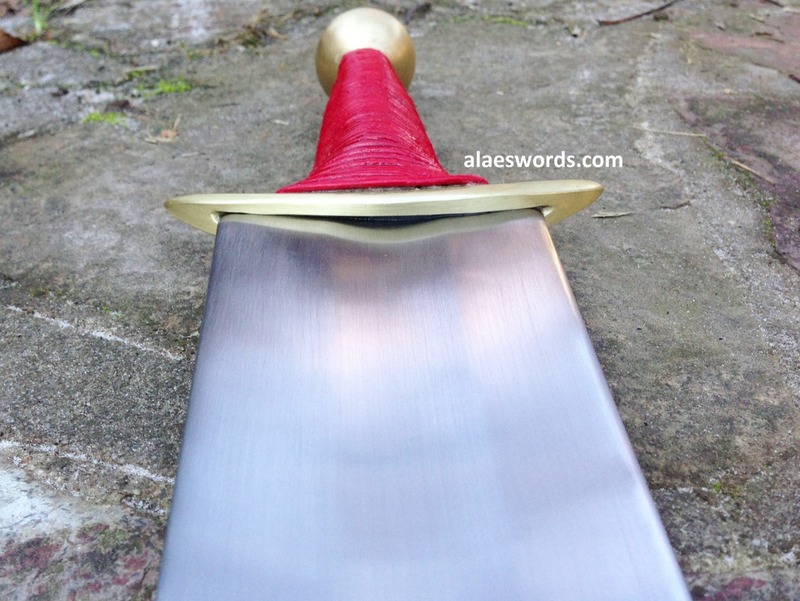 THe offset tang and groove near the edge are characteristics of back-edged swords, from the Norse Saxes to 19th century sabres, yet this is an otherwise conventional double-edged blade. About 1cm of the point is missing. 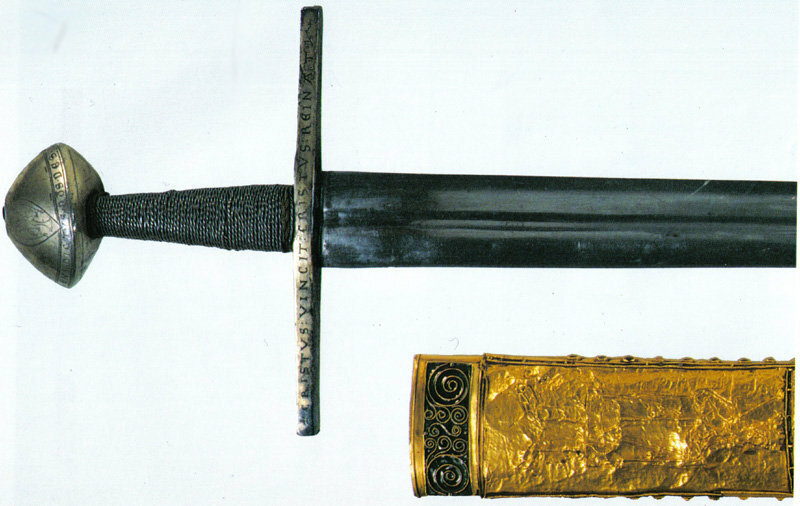 The cross and pommel are decorated with strips of gold ribbon, engraved with tiny chevrons, inlaid in the iron of the well preserved hilt. 3. This has a a pattern-welded blade with the ‘ANN’ pattern all the way down the fuller. The pommel is extremely flat in profile. Condition: Excavated (probably a river-find). The blade is good with a little corrosion under the patina. The pommel and cross are of copper, maybe once gilt; but when I handled it in 1961 I couldn’t see any traces. There is a cross patee engraved on the faces of the pommel, and each broadly-splayed end of a the cross guard is engraved with a little grotesque figure, a large round head with legs coming from under its chin, enclosed within a circle with tendrils going back towards the ecusson. The figure is so strongly akin to the ‘Babewyns’ in English manuscripts of the period c.125-1320 that it is inevitable that one should suggest an English origin for the hilt. The blade may of course be alot older. There is in the fuller on each side an inscription of three letters, o s o. Comparison with other sowrds (ie. No. XI.1 here) which have to be dated to the 12th century points clearly to a date c.1125-75 for the blade – a good example of an old blade re-hilted c.1270 plus or minus a decade or so. 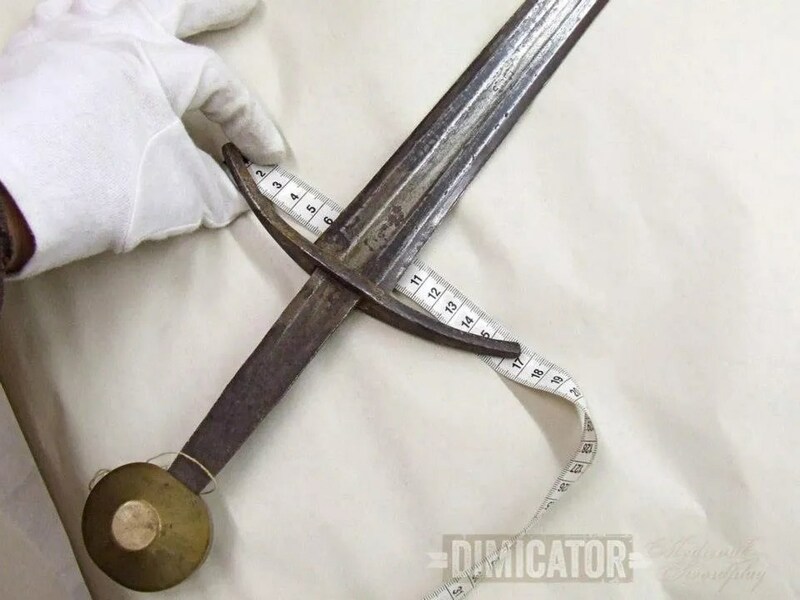 Although not shown with these pictures, the inscriptions on the top of the pommel’s stud show that this sword had belonged to a Trecenarius of Legion II Traiana Fortis. Although it is well established that the Praetorian Trecenarius had been the top Centurion, the position of the Legionary Trecenarius has not been established. There is one theory that the rank was second to the Praefectus Castrorum. Part of the inscription reads “TRECEN” and the other part reads “II TR GER”, this suggests that this sword had been commissioned when Legion II Traiana had been awarded the title Germanica, most likely in 213 with the defeat of the Alamanni (although the fighting actually ended with a treaty, the Romans considered it a victory) or shortly thereafter. The inside of the stud has inscriptions and symbols of the defeated Germanic tribes. The idea of the defeated being thrown into a hole can be seen with various artifacts on this website. 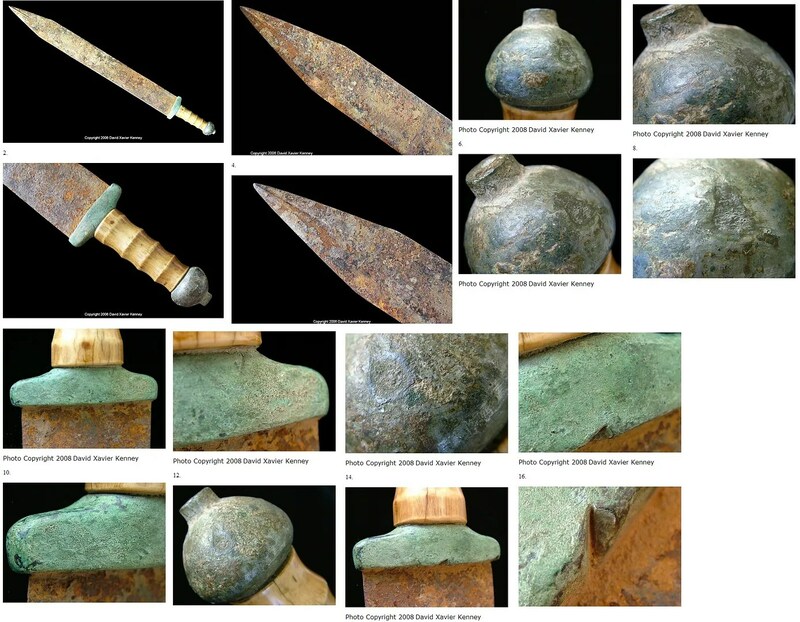 The iconography on the pommel highly suggests that the sword has meteorite metal. Under the green patina, the guard is black with work done in white overlay. The blade has engravings and decorations, most notably is a sword with a dragon grip and lighting (that is in fact chromium) coming from the sword’s tip. The blade appears to have been treated with a tinted black chromium or with an alloy with chromium, hence the Class I to II condition that deems it as the finest example of a gladius known. So I just finished off another Spathion, this one with a fuller and a characteristically Byzantine down turned cross guard. 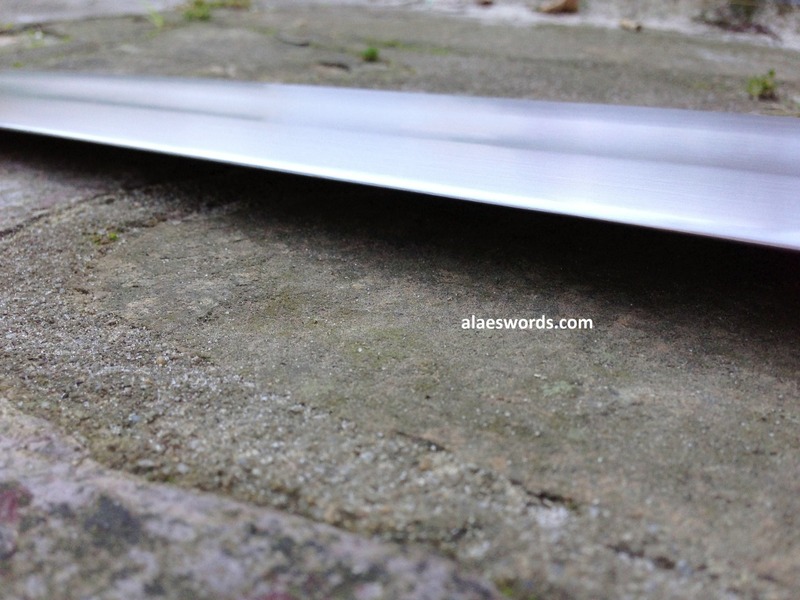 A touch over 30 inches long, 1.3kg (2.8lbs), blade width of 8cm (3.14 inches). Peened, countersunk pommel, pommel also rammed on and cold fitted as was the guard. Handles like a dream, a real ‘hewer’. Makes beautiful sweeping cuts and is excellently balanced for thrusting. Really happy with this one! Excited to watch the verdigris develop on the guard and pommel! I did a hand polish on this sword, which I’ve grown really fond of. It’s has a more dynamic appearance, the grain is more alive. I used Tasman Oak on the grip held in place with two tonne per square inch strength epoxy. The grip was then wrapped in hemp and vegetable tanned goat leather. All Australian materials and workmanship as always!